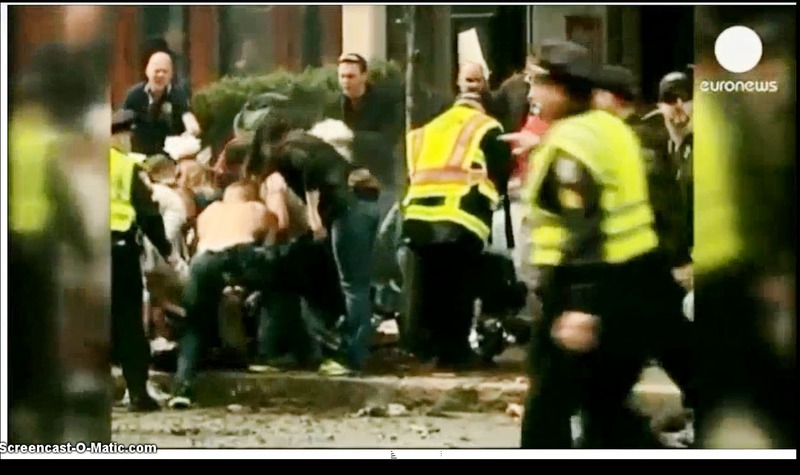 The world is once again in a state of shock after what had happened at the “Boston Marathon Race Bombing of April 15, 2013. And while many are still trying to figure the whole story of those events surrounding the bombings, many other facts have surfaced, and many others which I know of, which shall aid us in finding out the whole of the truth of what actually happened and, quite possibly, who is actually behind it all. 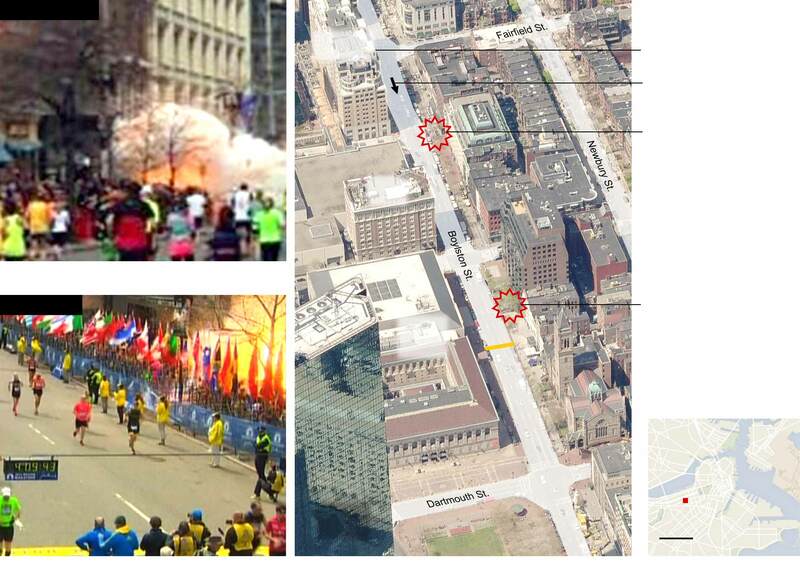 Figure 1 we can see that there were obviously two explosions on Boylston St. in Boston, very close to the finish line of the Boston Marathon Race. 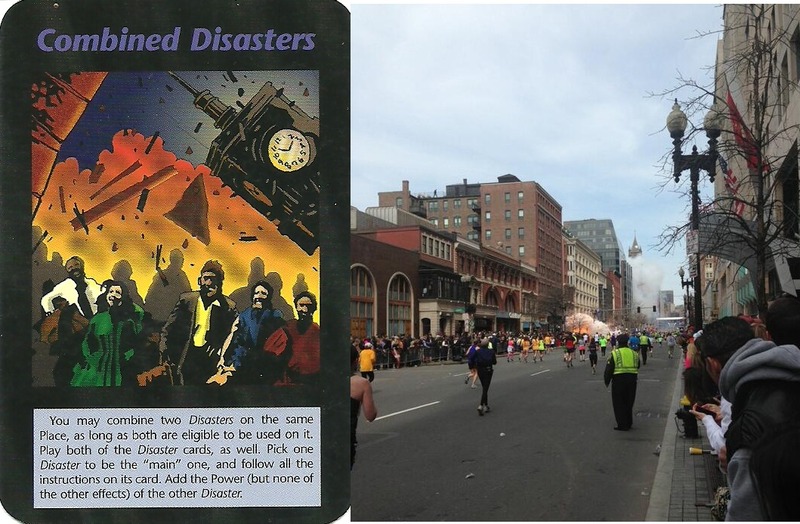 The most immediate questions I’ve been asked about the explosions are: “Are there any Illuminati Cards that speak of this event”, “Is the Illuminati behind this”, and “Is there any evidence which support the idea that the bombing was a contrived occurrence?” Let’s weigh through the evidence and see what we can determine thus far. 2) The second line reads: “…a +2 on any Assassination attempt”. 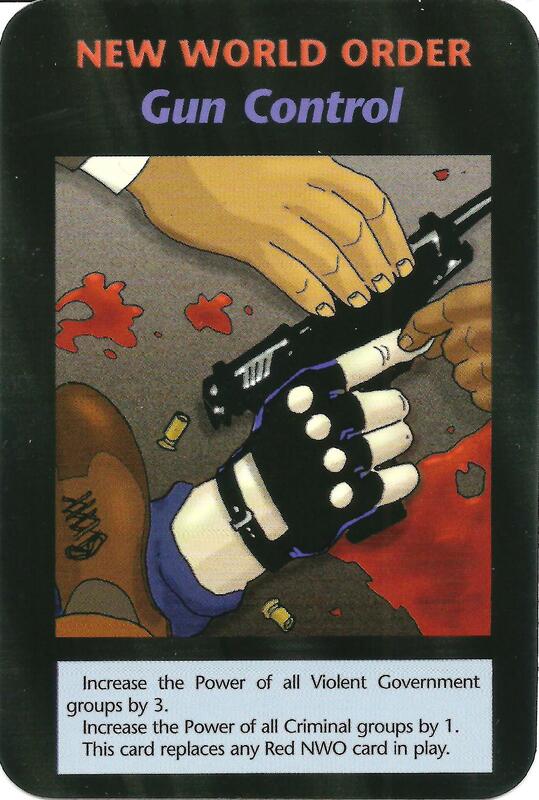 The “+2 on any Assassination attempt” tells us that there is an “Assassination” involved with this card, and this is further emphasized by the fact that the word “Assassination” is italicized on the card. 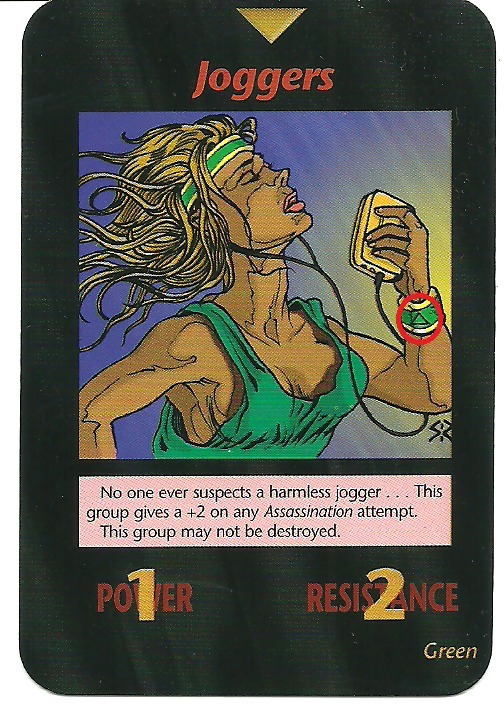 And, the plus 2 can/does refer to two assassination events or, the two bombs that were planted near the finish line of the race. 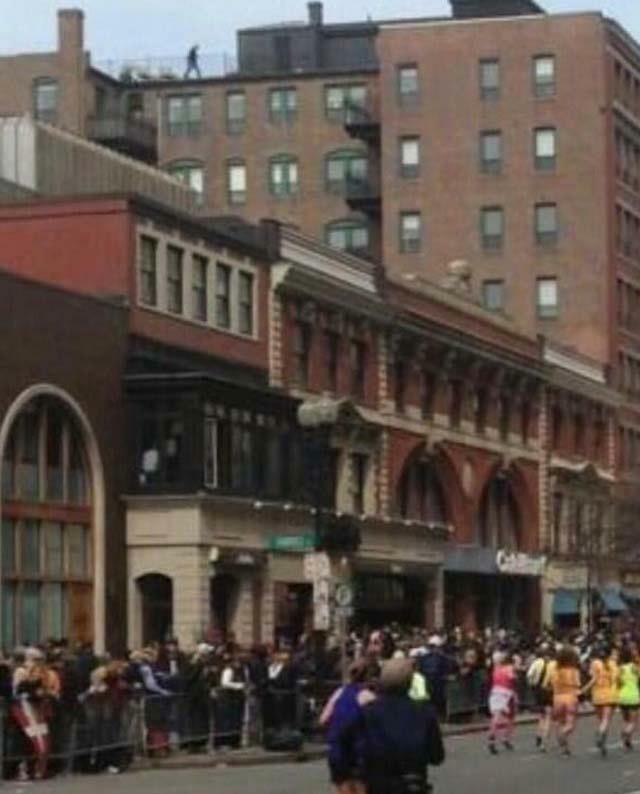 Sad to say but, many were injured and “Assassinated” during the race. 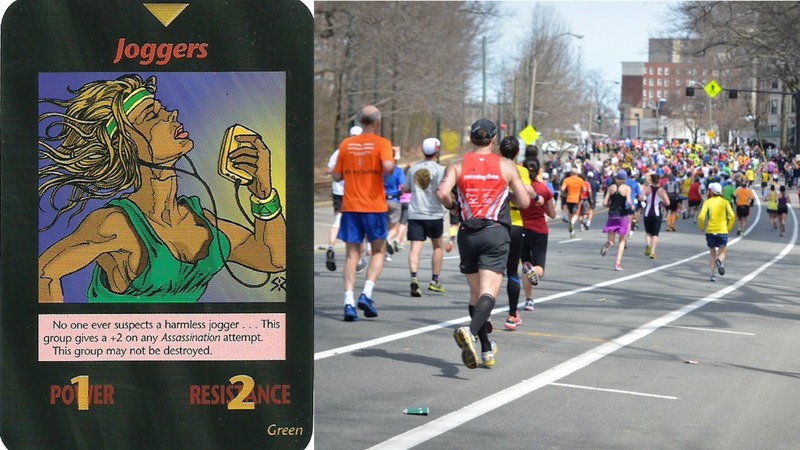 Booston Marathon Race April 15, 2013 the card does fall into place with the Boston Marathon Race. Let’s move on! 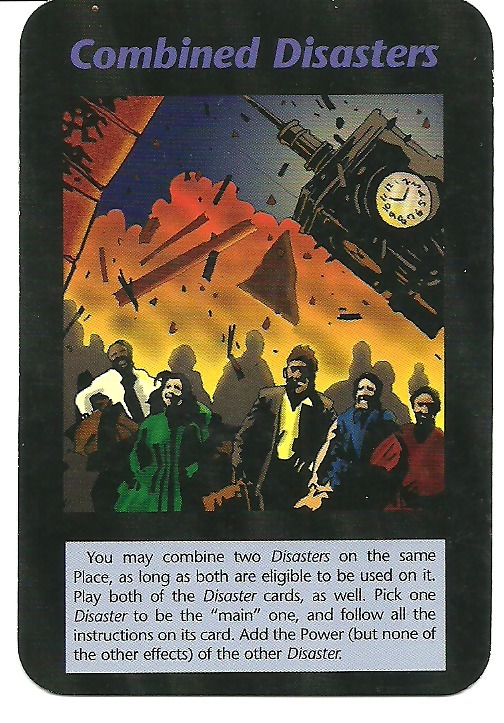 1) The title of the cards reads “Combined” which means, more than one disaster would happen. And, it did! The JFK Library was also part of the overall events of the day. Combined Disasters . The exact time on the clock reads “2:55”. 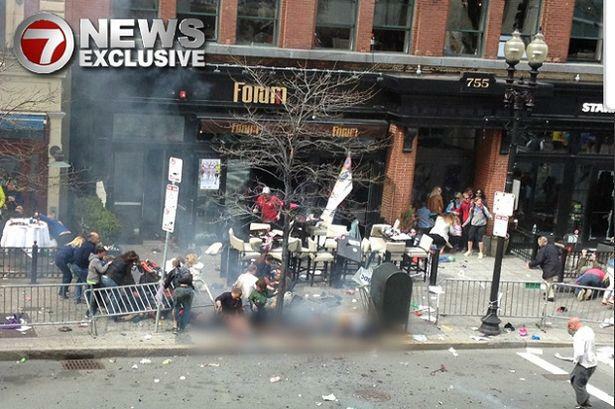 This is only minutes within the exact time the actual bomb went off. Combine Disasters and you will see for yourself there is another capstone (a pyramid with the Illuminati Eye of Lucifer near the top of the pyramid). Figure 8, but you also notice this aligns up with the “Joggers” card because of the obvious Boston Marathon Race going on. 3) There are exactly “18 likes” or what comes out to be “6+6+6”. 4) There are other “666’s” to be found but, for now, let’s move on. 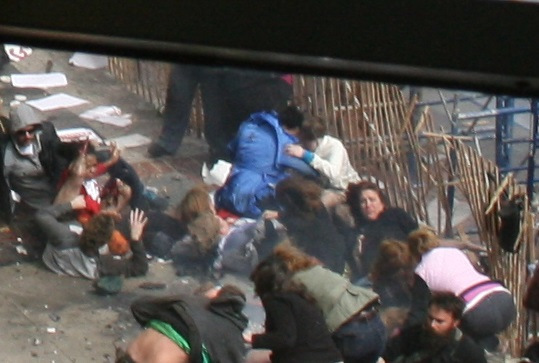 The story of the Boston Bombing really gets mysterious now. 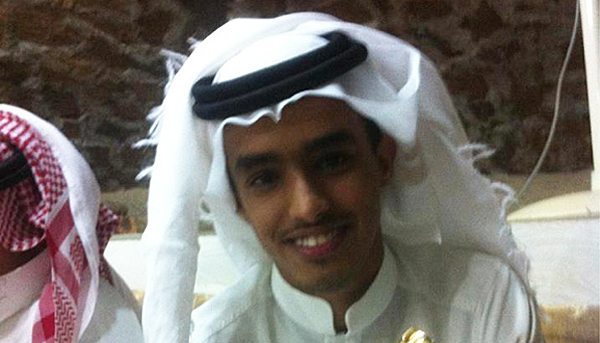 CNN News, a propaganda unit of the government, stated throughout the day of April 17, 2013 that police officials had a suspect in custody. However, not only was that a lie, but the FBI contacted CNN about this and they were forced to apologize and retract their story. 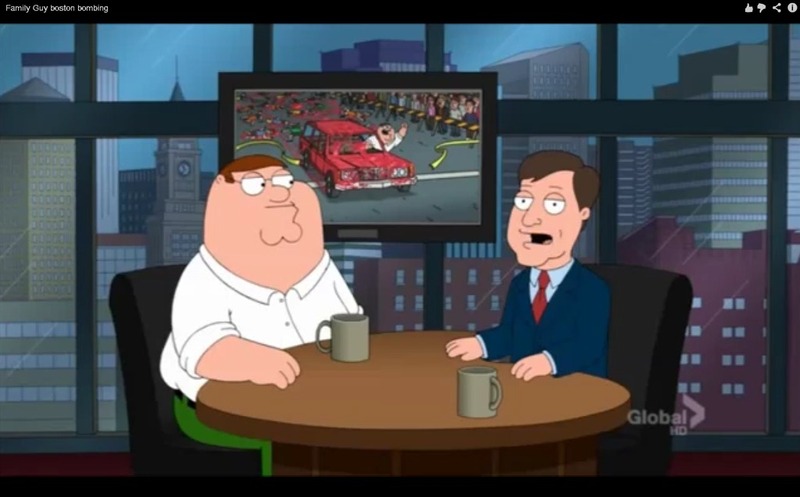 Family Guy Boston Bombing 1, Turban Cowboy we can see Peter behind the wheel of a vehicle and immediately behind him are all those people he ran over to win the Boston Marathon Race (Figure 15a). 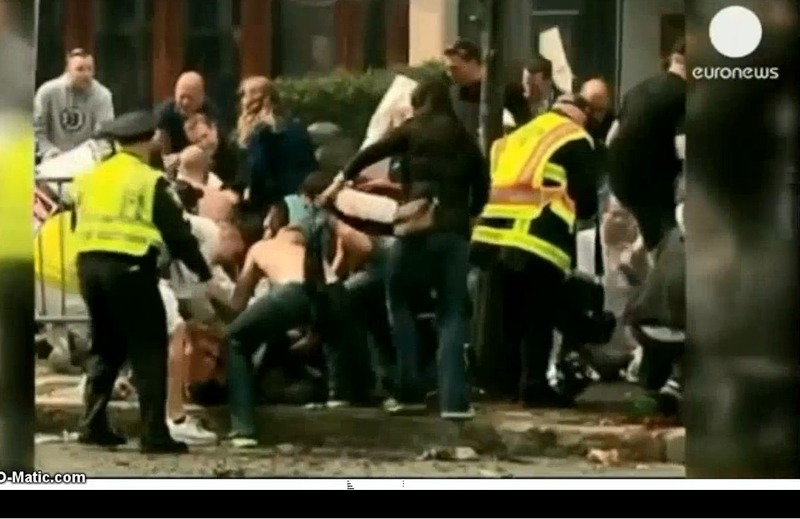 Even though both events, the multiple deaths and injuries, and the two cellphone detonations are separate ones, they explain perfectly everything that has been told on the news about the Boston Marathon Race. Is this a one in a trillion chance coincidence or, did the Illuminati plan these things ahead of time as I have so often proven in the past? I am convinced they did. Again, I will get to this shortly. 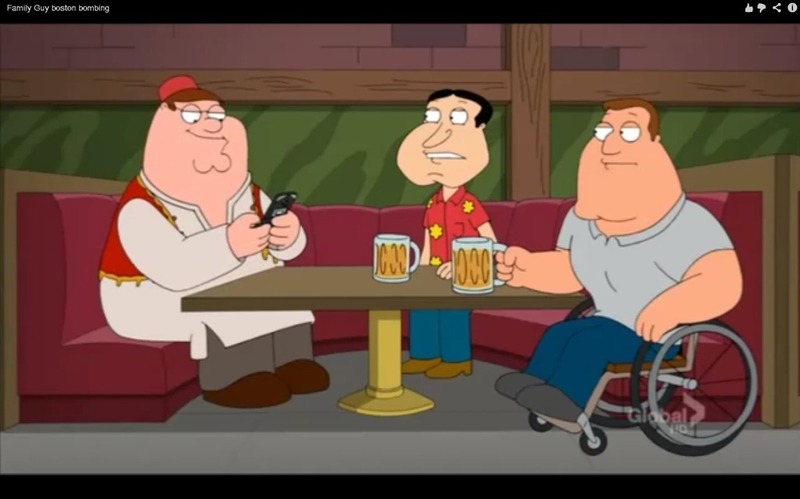 *Note – I will try and see if I can have the Family Guy episode, “Turban Cowboy”, put up on my web site for everyone to view. 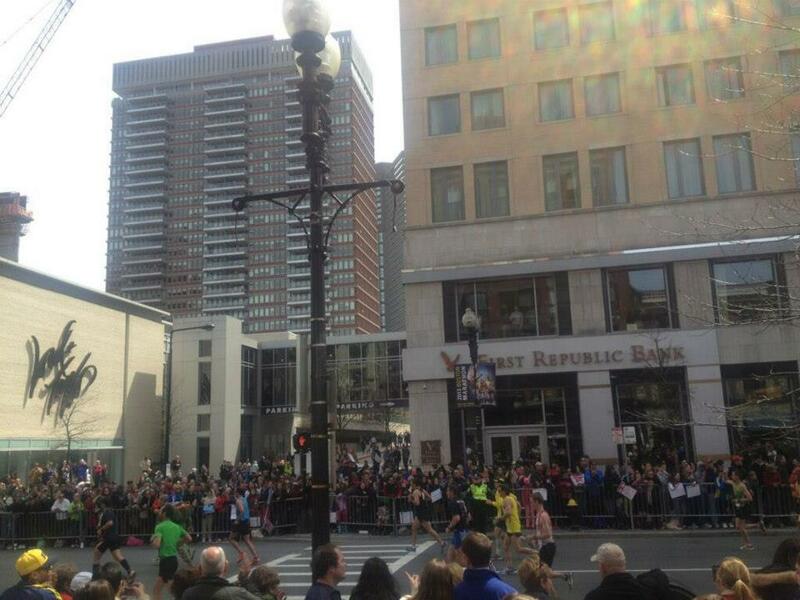 Boston Bombing First Federal Building, the finish line . 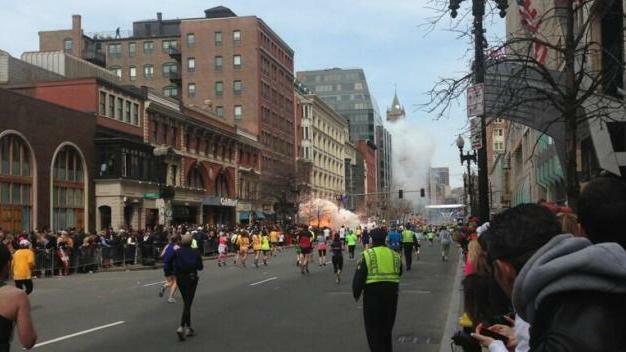 Figure 20 you can see the second explosion, and the first one further down the road. 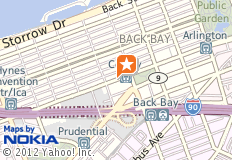 Map of 666 Boylston Street in Boston, MA 001 will verify the Yahoo location and the street address when I was authenticating the building and the actual street address. This is the other “666” I had spoken about before. 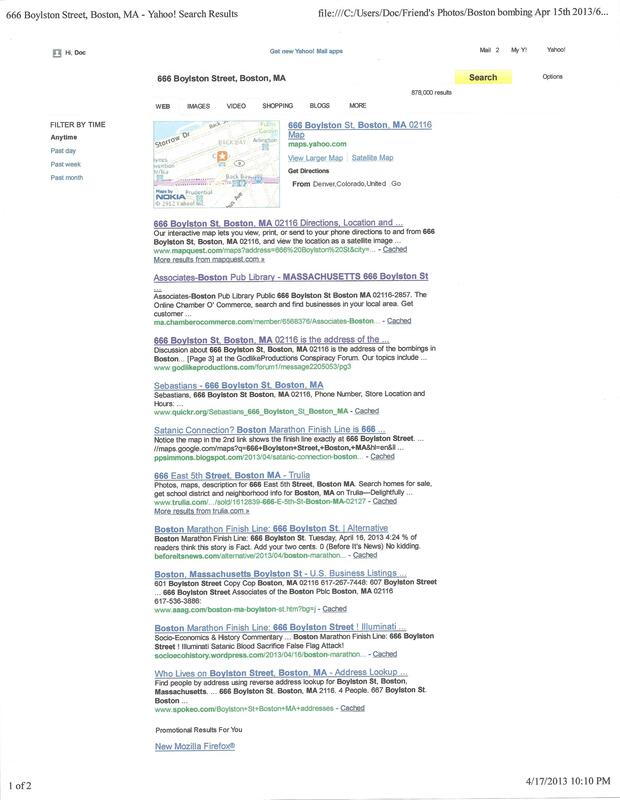 This is no coincidence Ladies and Gentlemen; too often in the past we have seen this used as a “calling card” for activities of the Illuminati and, in this case, this “666” street address says it all. Figure 25? 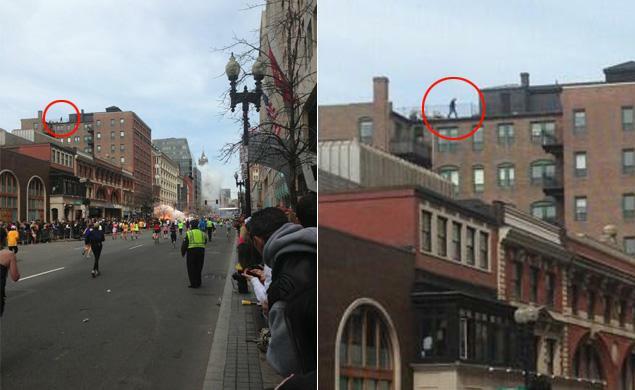 Is he in on the bombing? ”. What is going on here??? 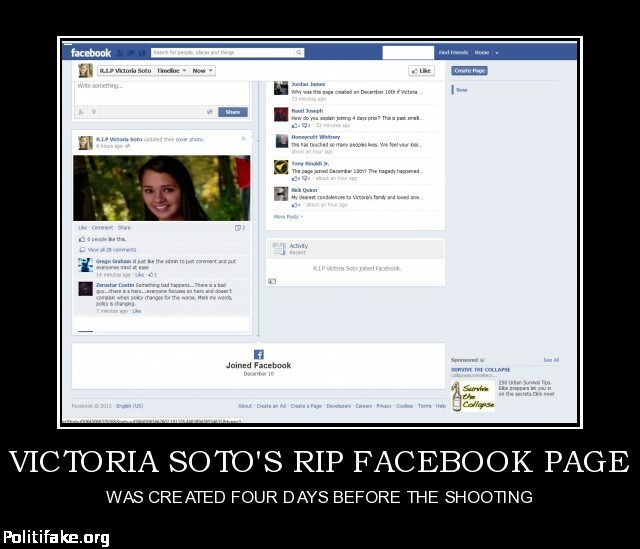 Did she, or did she not die at Sandy Hook? 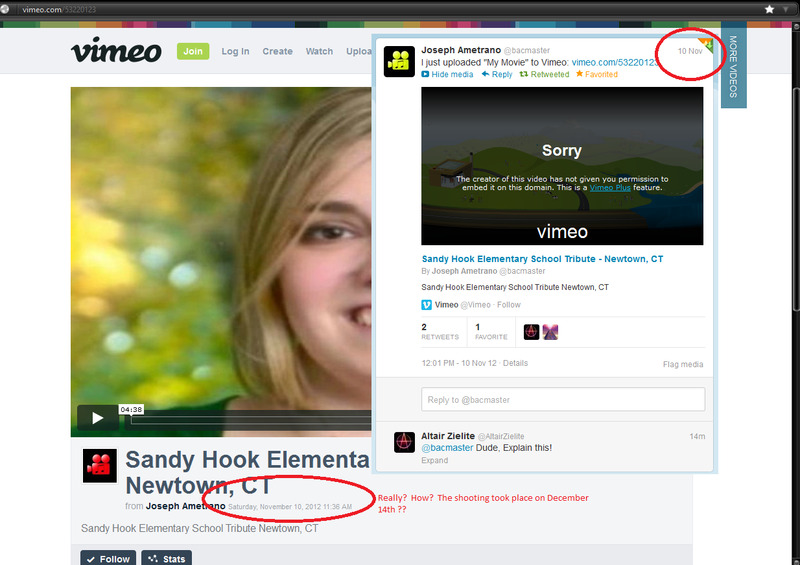 And, if not, what does this tell us about the Sandy Hook massacre? 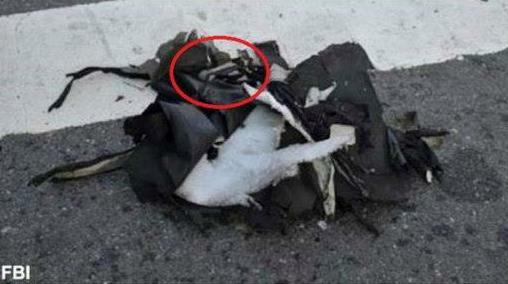 Boston Bombing - Is that a Craft Skull on the bag it shows, what appears to me as one of those black backpacks those mysterious men were wearing. 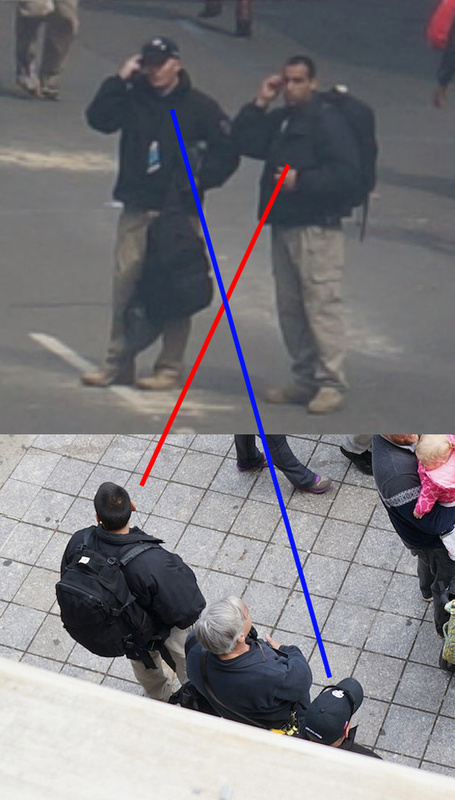 Boston Bombing 9 - The Private Military known as the Craft with their skullhead” match up perfectly. The term “the Craft” is another term Illuminati members refer to their religion when they’re out in public. They say “the Craft” so people won’t know precisely what they’re talking about. 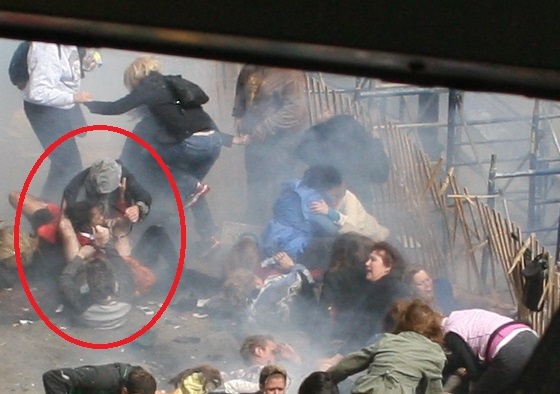 Were they part of the so-called “bombing exercise” that the news has been reporting every now and then? And, if so, if this were to have been a “simple exercise” why did those bombs go off then? 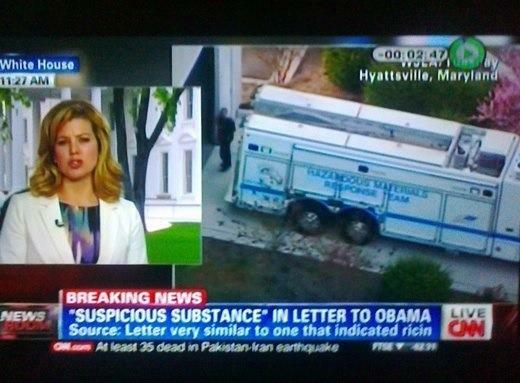 When we look at all of the events, the two bombings (and as many as 2 or 3 others which didn’t explode), the JFK Library fire/explosion, and the Ricin sent to the White and The Capitol, I don’t see how any of these events could be separated. They all seem to be joined at the hip as they say. 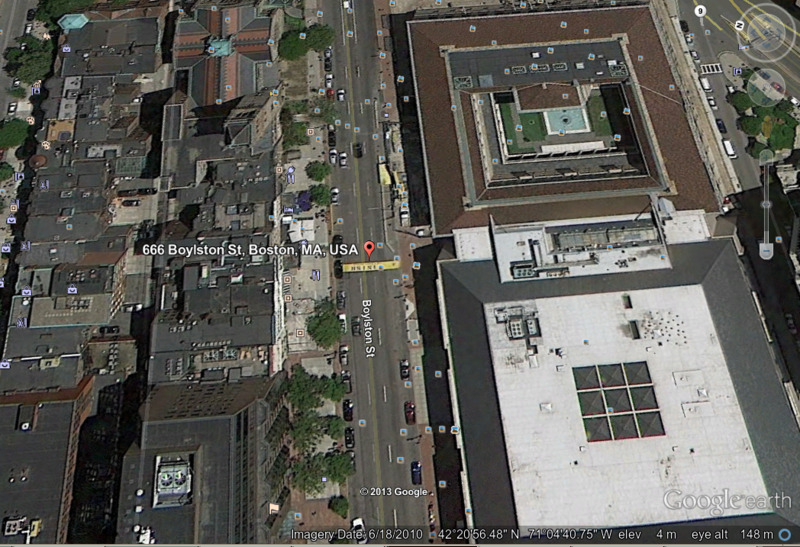 4) The address where the second explosion occurred at the Associates – Boston Public Library, is “666 Boylston Street”. 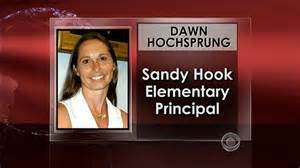 5) The mysterious, reappearance of Principal Dawn Hochsprung, who was “supposed” to have been killed at the Sandy Hook murders, appears on the news and was reported to have been within a few blocks of where the bombs exploded. 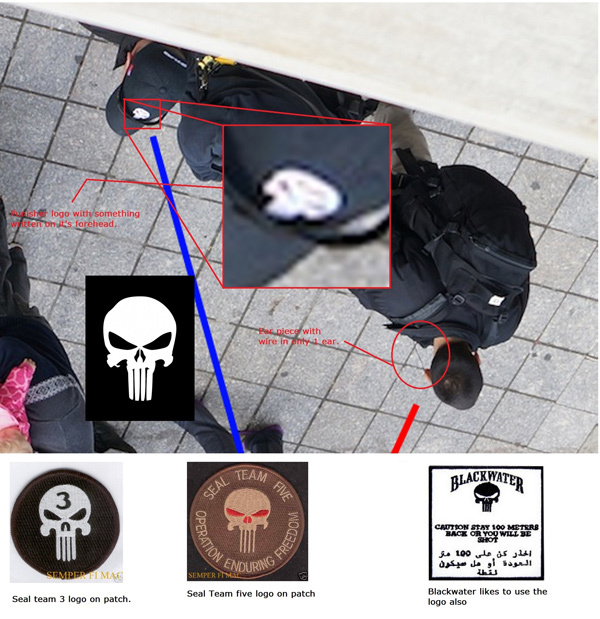 6) And mysterious men, dressed in black wearing a “deathskull” on their caps, from a private military group known as the “Craft” are seen at the scene of the crime wearing backpacks and, one backpack seems to have been theirs. 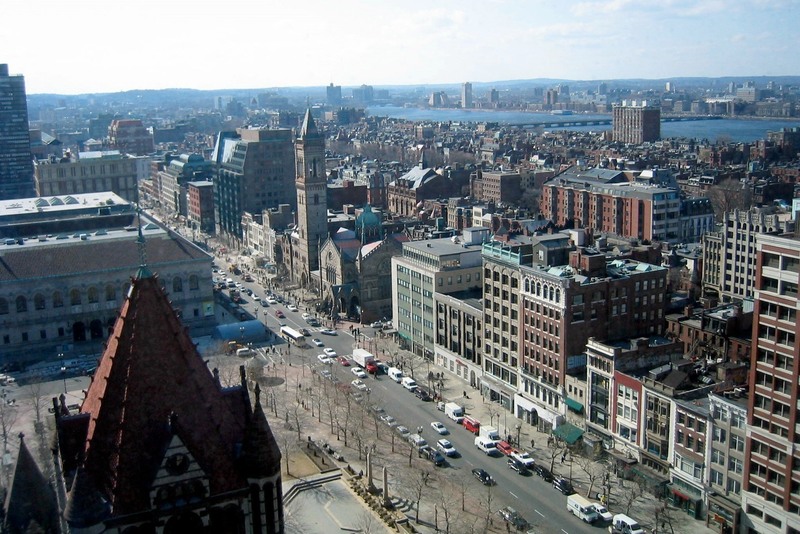 Boston Bombing 755 Boylston St. certainly were known ahead of time which, only leads me to believe, especially with the repeat number off 666 (a calling card for the Illuminati usually left to mark their territory), that the Illuminati had a hand in these events. 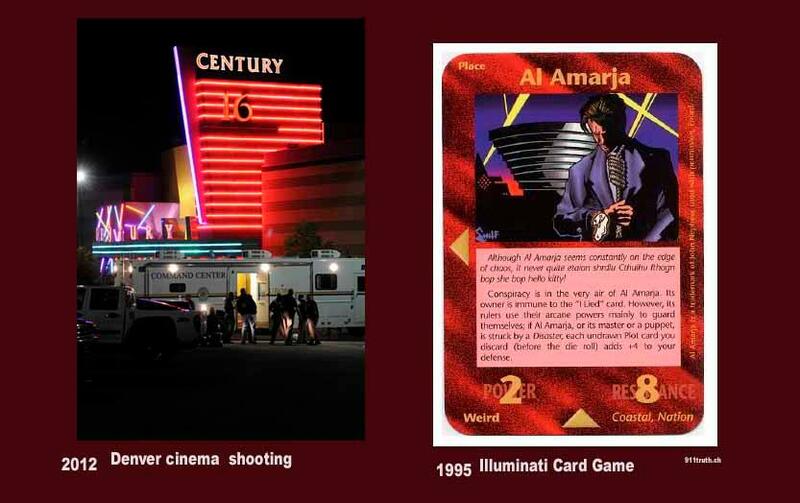 At this point, all we can do is be patient and wait for further developments and, if we’re very fortunate, more evidence will surface which will help us in determining more of the Illuminati’s involvement in this tragedy. Please bear in mind that, even though we are looking deeply for Illuminati involvement in this tragedy, people have been murdered, maimed and seriously hurt. Pray for their speedy recovery and for the sake of their friends and families. Take care my Brothers and Sisters, and all my friends out there. God keep each and every single one of you…Doc! 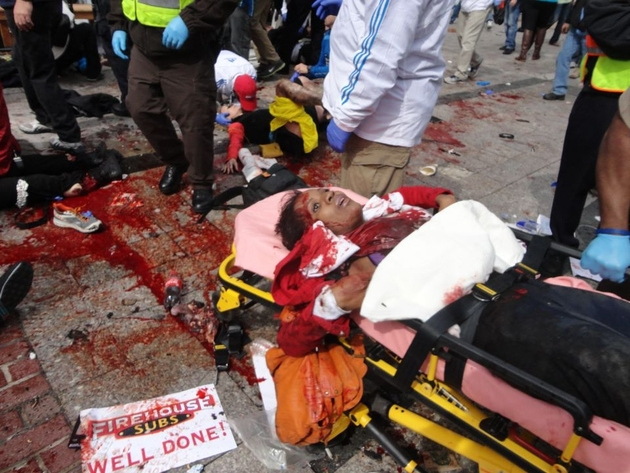 Less than a week ago I posted up an article on what happened at the “Boston Marathon Race Bombing” which happened on April 15, 2013. And while both suspects had been identified, one killed and the other in the hospital as of this date, more questions are surfacing then answers. And I don’t like where the questions are leading us towards because it’s beginning to reeks of another one of the governments “False Flag Operations”. 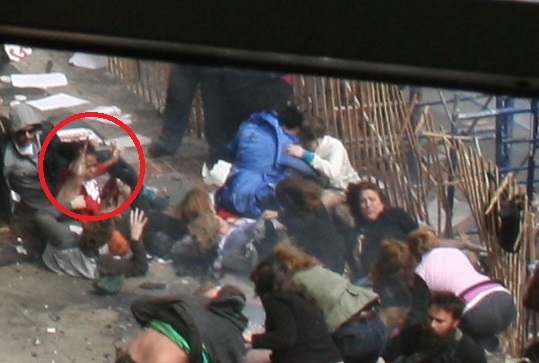 Boston Bombing 14 This lady, Dawn Hochsprung, was supposed to have died at the Sandy Hook Elementary School shooting. had been created as a tribute to what had happened at Sandy Hook. 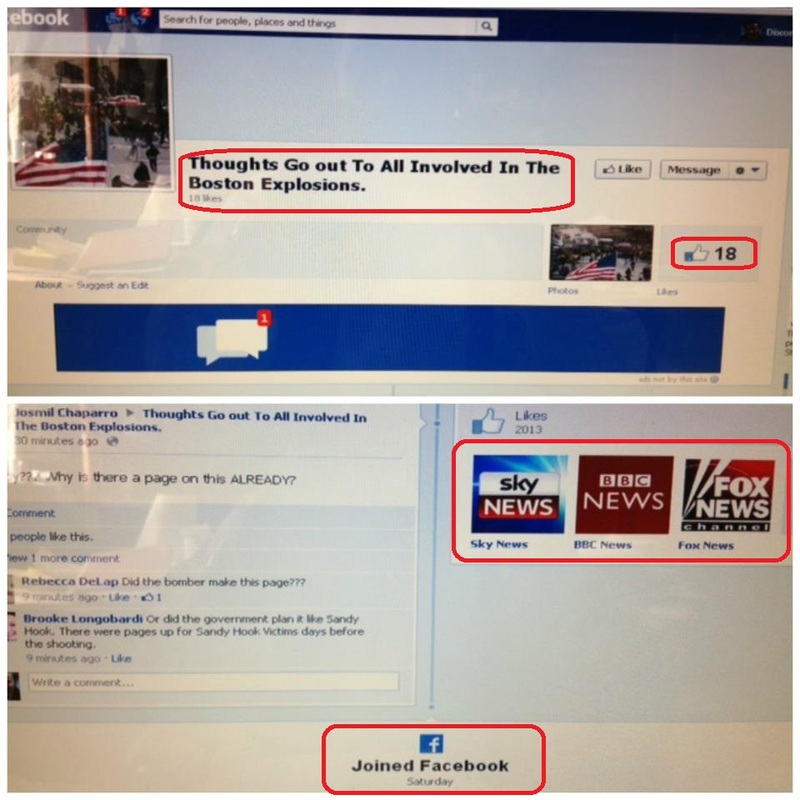 This web page had been put up “32 days before the shootings at the Sandy Hook Elementary School” had happened. 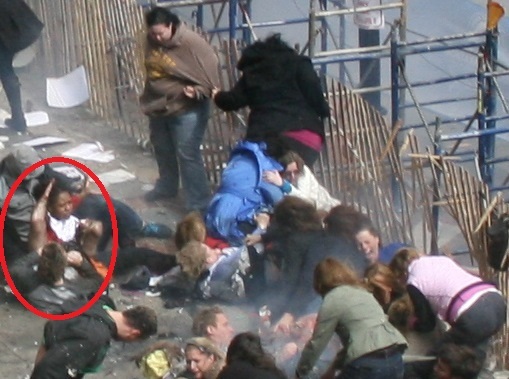 This lady, Dawn Hochsprung, was supposed to have died at the Sandy Hook Elementary School shooting at being near the bomb explosion at the Boston Marathon Race. 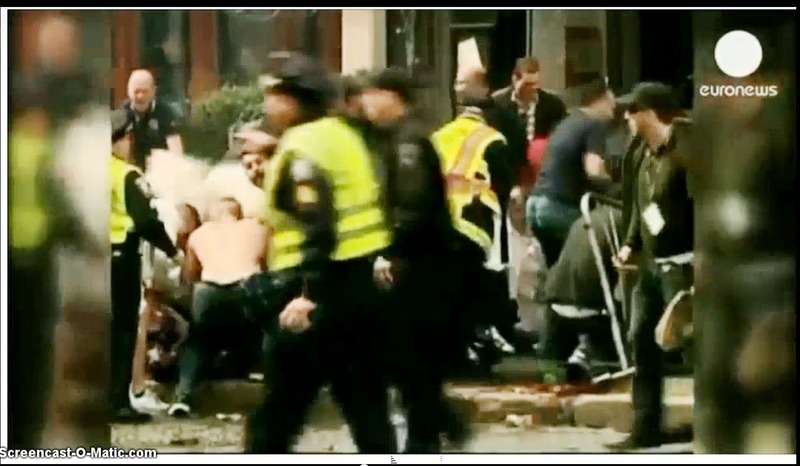 So why are these undercover government agents running away from the scene of this heinous crime... at the Boston Marathon Race Bombing as undercover agents of our government. Femoral Arter which is in the thigh and is a continuation of the external iliac artery. Somewhere around half of his blood would’ve been lost in the first minute of his injury. Unless he was receiving intravenous blood, and extremely quickly, he would’ve died within two to three minutes from blood loss. Yet, in the photo, it’s quite obvious there is no “I.V.” going into his arms. 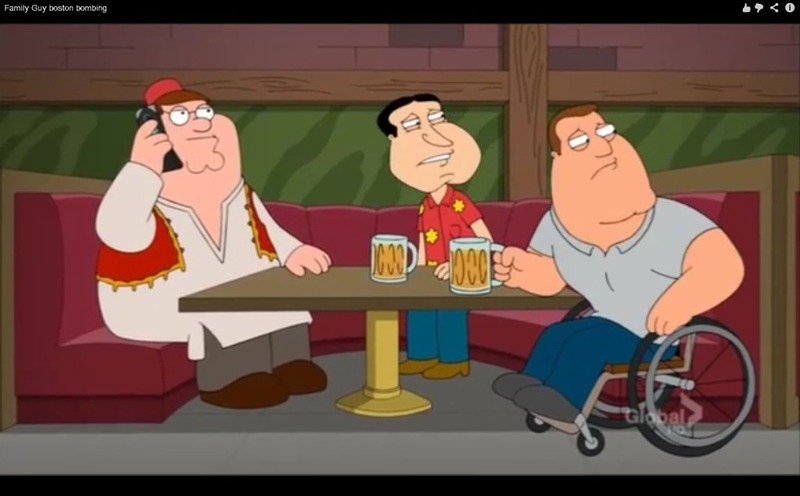 b) Because of the nature of his injury, Jeff should’ve been put onto a gurney with his legs elevated to help stop the blood from pouring out of his legs. And, I do mean pouring. Because of the femoral arteries being blown away, blood should have been spewing all over the place. So, you would keep the legs elevated but, instead they did the “exact opposite”. Plus, in order to prevent any sort of brain damage that could’ve occurred due to the loss of more than half of his blood and the normal amount of oxygen being supplied to his brain, he should’ve also been laid on his back with his legs elevated. c) Again, his “femoral arteries” were violently blown off of his body and blood should’ve been gushing out all over the place. Take a good look at the street below Jeff’s wheelchair, and behind it. There’s no blood! Where is the blood??? And, if the tourniquets were supposed to be stopping the blood from flowing, why wasn’t he placed on his back and, why don’t we see blood dripping from the surrounding wounds? Tourniquets cannot account for this. d) The bone that is sticking out of Jeff’s leg was supposed to have been traumatically blown away by shrapnel. And, yet, when I enlarged the photo to take a better look at the end of, what appears to be the “tibia bone,” it is perfectly smooth and straight. I have seen a lot of trauma in my days and NEVER ONCE have I ever seen a bone cut “perfectly smooth and straight” as this photo would have us believe is the case. No! In fact, that bone should appear to be fragmented if it was genuinely and traumatically blown off. e) People who have had such trauma as this done to them usually are screaming at the top of their lungs because of the unbearable amount of pain they’re going through or, they’re unconscious. Yet, not only is Jeff cognizant of his surroundings, he is quite calm and collected. f) Due to the amount of blood he should’ve lost due to arterial bleeding, Jeff should’ve been as white as a ghost and, yet his skin is the same shade as the lady behind him and the man behind the cowboy hat. The medical observation and evidence alone convinces me this person is a fake! 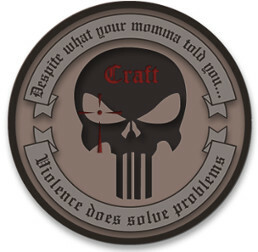 Craft logo “No matter what your momma told you…Violence does solve problems”. 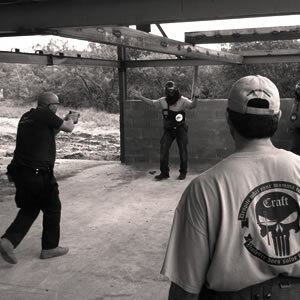 Members of this private, military organization are more than capable of causing what occurred at the Boston Marathon Race Bombing. I’m not saying they did! What I am saying is that they are capable of doing such acts of terror and, that their logo does make me think twice about the whole of what had happened. There has been another warning. Now, before we go any further so no one jumps to conclusions, let me say this for the record: “There is no way of proving, one way or the other, that this new warning is genuine or not.” However, because I would be totally remiss in my duties as a teacher if I didn’t show you this next photo, I feel I have to. But, remember, “we don’t know if this next figure is genuine or not”. Possible we see another pre-warning. 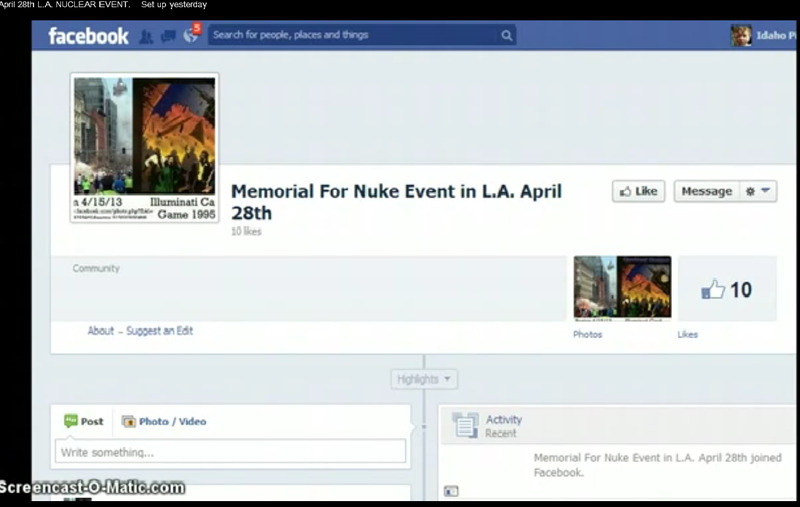 According to the caption, on April 28, a nuclear bomb is supposed to go off in Los Angeles, California. Now, remember, “we don’t know if this is true or not!” This could simply be a copycat person, a person with a sick and twisted sense of humor, a person who is bonkers, or just someone who wants a lot of attention. DO NOT start a panic, DO NOT say this is “a fact” when we don’t know if it is or isn’t, and DO NOT allow yourself to end up in a state of utter and complete fear!!! Remain calm and cool and pray that this is only a joke and that nothing comes of it. Personally, I am praying that if this is real, that God intervenes and prevents it from happening. It has been reported that there “could be” as many as a dozen dirty bombs (briefcase size nuclear bombs) that could be exploded in America but, remember, it was reported only as a “could be” and not as a certainty. 4) Another pre-warning has been issued (if it is real). 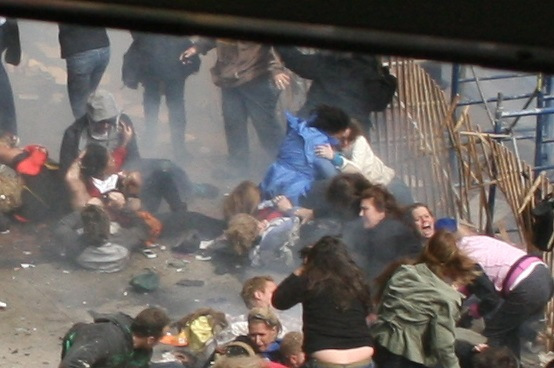 5) And too many other people who were at the Boston Marathon Race Bombing had no business being there unless, something else is going on and we’re just not being told the whole truth. This is very disturbing for me Ladies and Gentlemen. As Americans, we are so very fortunate to live in a country where we have all the freedoms in the world to enjoy. So, how is it we are living in a land where deception and deceit seem to be rampant? Is our OWN government behind any of these events? And, if they are, how could this happen here in America? can be laid at the feet of the Illuminati. 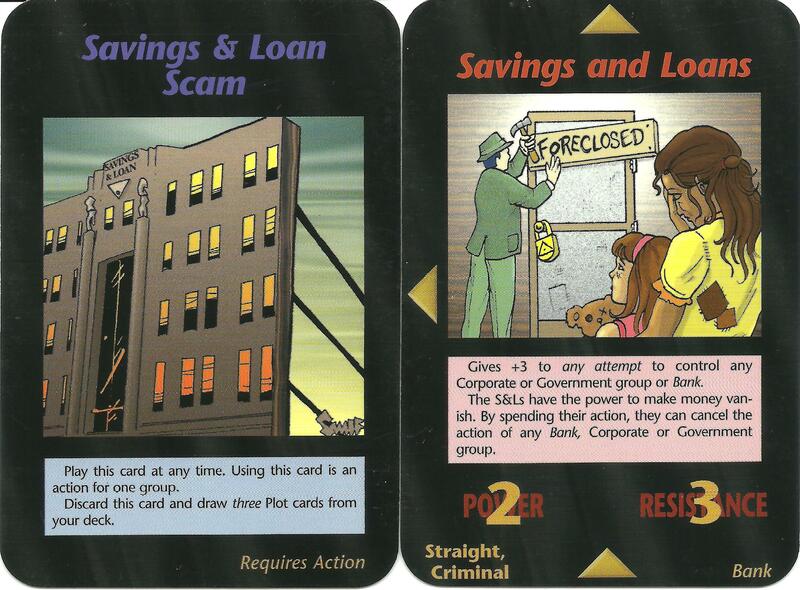 And in every case, the Illuminati New World Order Cards proved that these events were going to occur. Coincidence??? 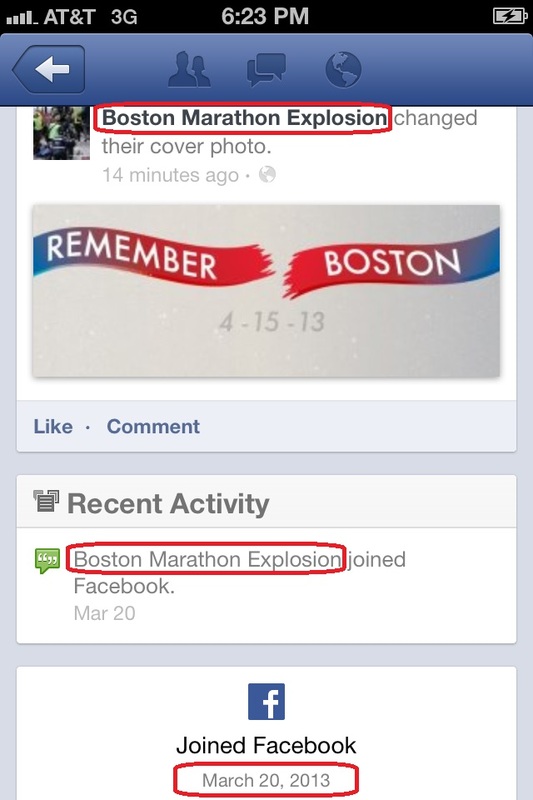 I’m a person who believes that: once is an accident, twice is a coincidence, three times or more…something’s going on! And I’m convinced something is going on here but, I can’t show, you good folks, who’s behind it for now. All I can do is be a responsible teacher, present you with what we know, and let you draw your own conclusions. But, please, be cautious. A lot of this information could be looked at in so many different ways, especially that warning about the so-called nuclear bombing that’s supposed to occur on April 28, 2013. And, unlike what the media has been saying, I am not sending out these warnings because I’m a right-wing nutcase, nor am I religious zealot who needs psychiatric help, nor am I doing this in bad taste. I am a concerned individual who sees too many questions that have no agreeable answers. In fact, I hear too many so-called answers that make no sense whatsoever. Still, exercise caution when going through the material I just presented. And, if any of it can be proven to be untrue, please contact me @: docmarquis777@yahoo.com and let me know so I can change it immediately. Take care everyone and God help us through these terrible times we live in, and may He keep us all…Doc! 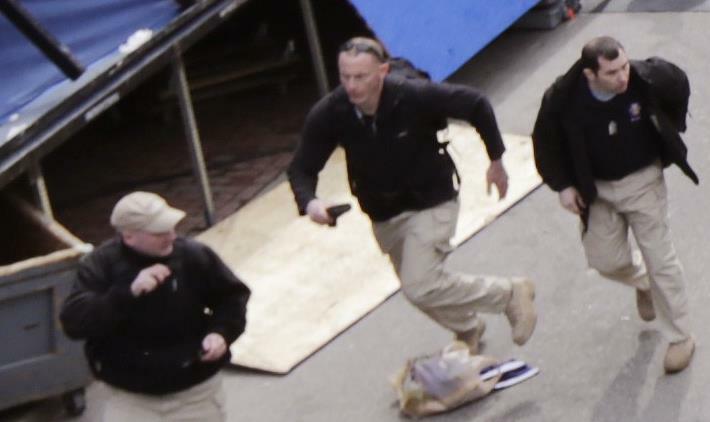 Just when you think this story on the Boston Marathon Race Bombing couldn’t get any stranger, a number of other twists and turns rear their heads. 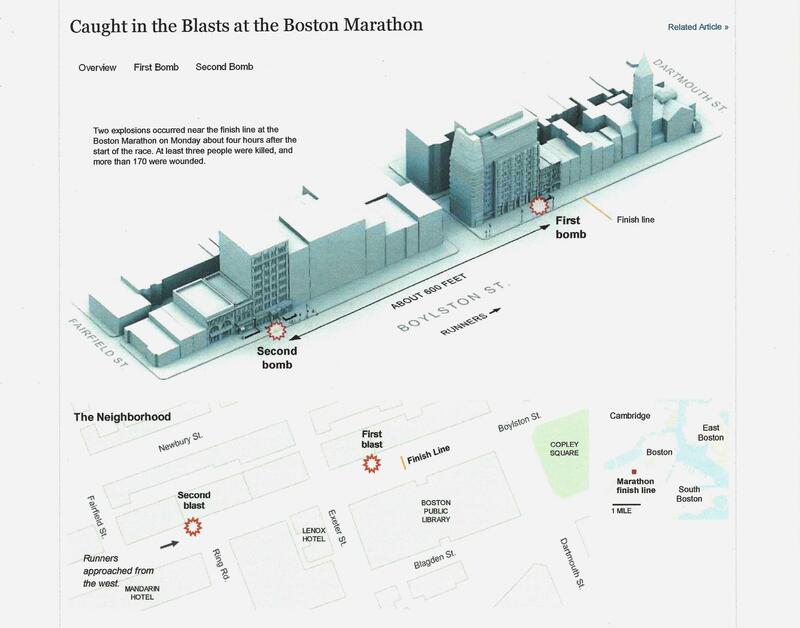 Without any further ado, let’s get into the new information which will add even more evidence that the Boston Marathon Race Bombing was a contrived occurrence. 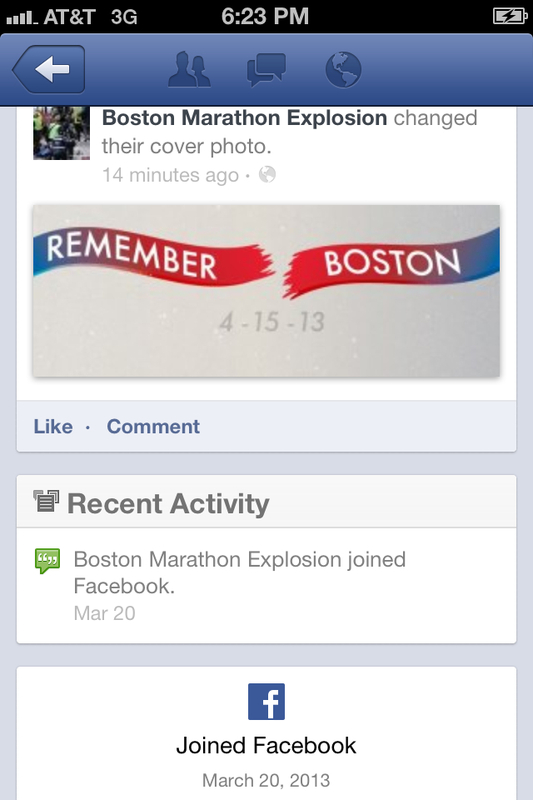 Jeff Baumann we see the photo of Jeff Baumann who has become the Poster Boy for the Boston Marathon Race Bombing. In Part II of this story, you’ll recall how I explained medically that the traumatic wounds Jeff supposedly received were faked. 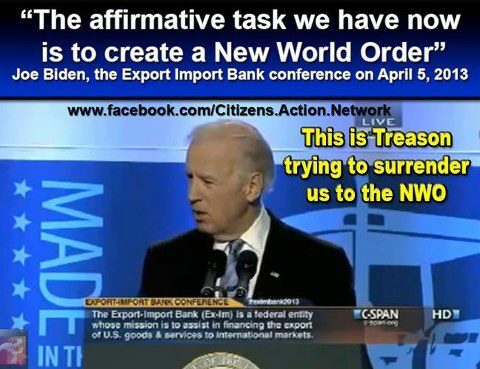 The following photos will once and for all demonstrate how much we have been lied to! The following photos, Ladies and Gentlemen, were taken seconds after the so-called bomb initially exploded. Figure 59b. Within the red oval, which I created, there are 3 people you must remember; the man at top of the oval with the baseball cap, the black lady below him and, right below that black lady is Jeff. 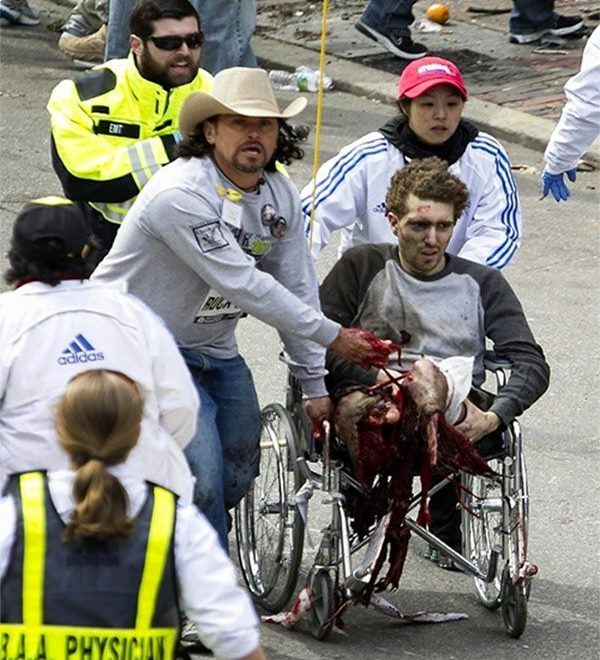 What is critical to note immediately is that Jeff supposedly had both of his legs blown off by shrapnel yet, look at the top of his legs; there are no injuries and, if there were, blood would be pouring down his legs. But, there is absolutely no sign of injury whatsoever. Figure 60a and, still, there is no blood or sign of wound on Jeff’s legs. Figure 60b and you can see how the tibia bone came out of nowhere. How did this happen? I’ll explain in a bit. Figure 62b and you can see this for yourself. Figure 63b Jeff’s leg is right by the black lady’s head. Why, if this is a genuine wound, is there no blood to be seen on the white collared part of her outfit? Blow up the photo as I have and, still you will not see one drop of blood whatsoever. Figure 63b, it got shorter. The tibia bone actually became shorter!!! How is this possible??? Figure 63b it wasn’t there. Again, this is impossible!!! Traumatic wounds of this nature do not suddenly appear out of thin air. with other actors, the green oval) to those others around him. It’s the same. Had those leg injuries been real he’s be white as a ghost and, either unconscious from the blood loss or, screaming in agony. 2) I have seen more than enough blood in my time while practicing medicine, and while being in the Illuminati, to know the difference between real and fake blood. The blood in the photo is not the correct color and texture. It’s absolutely fake! 3) The amount of blood on the ground does not account for all the blood Jeff should’ve lost. 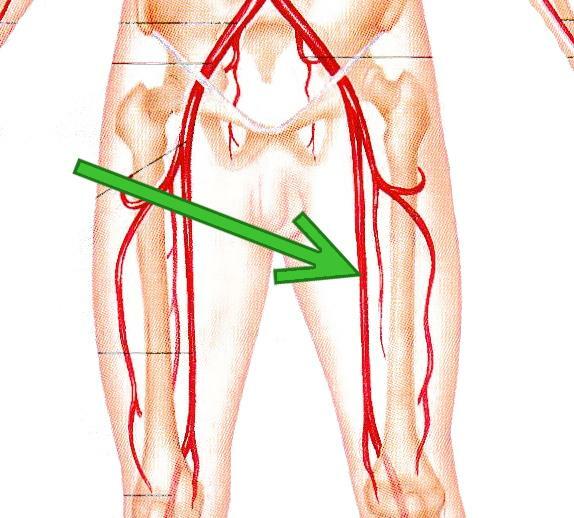 Both femoral arteries along with the iliac arteries were supposedly shredded and still, when we look at the photo there is not arterial gushing of blood, and I do mean gushing. 4) Being that Jeff is conscious, why isn’t he screaming in pain instead of look clam and composed? with other actors she was not in a state of shock but cognitive and, cognitive enough to have relocated herself. And, she was not covered in blood. 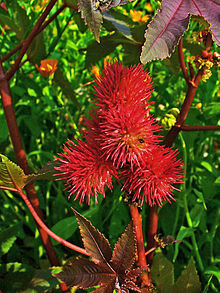 Notice, once again, how she had relocated herself into a pool of blood. 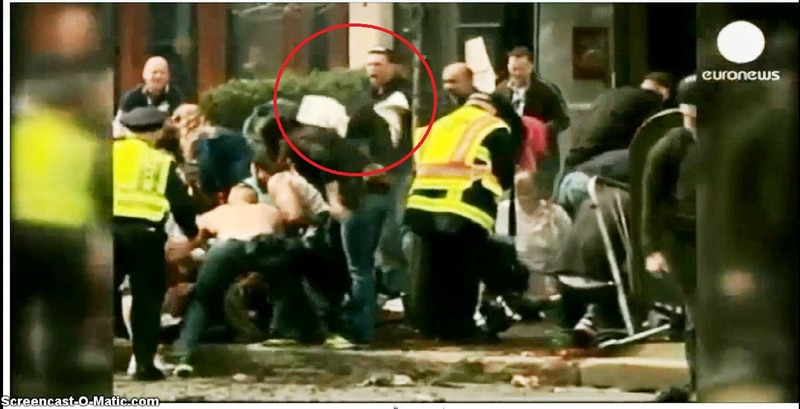 I believe that more than sufficient enough photographic evidence, which had been taken seconds after the bombs had gone off, can only lead us to one very obvious conclusion: this part of the Boston Marathon Race Bombing was staged. It’s a lie! 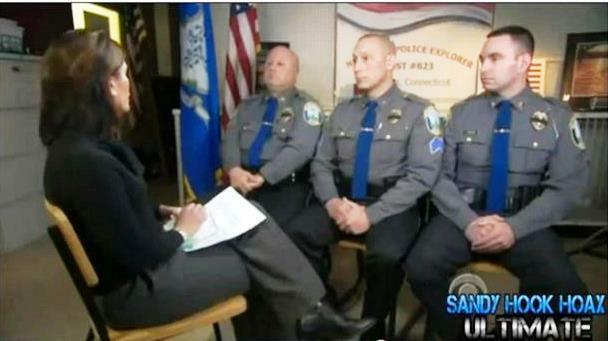 This Lady was at Sandy Hook and the Boston Marathon Race and Interviewed for both we have another person who was not only at Sandy Hook, she was also at the Boston Marathon Race Bombing. 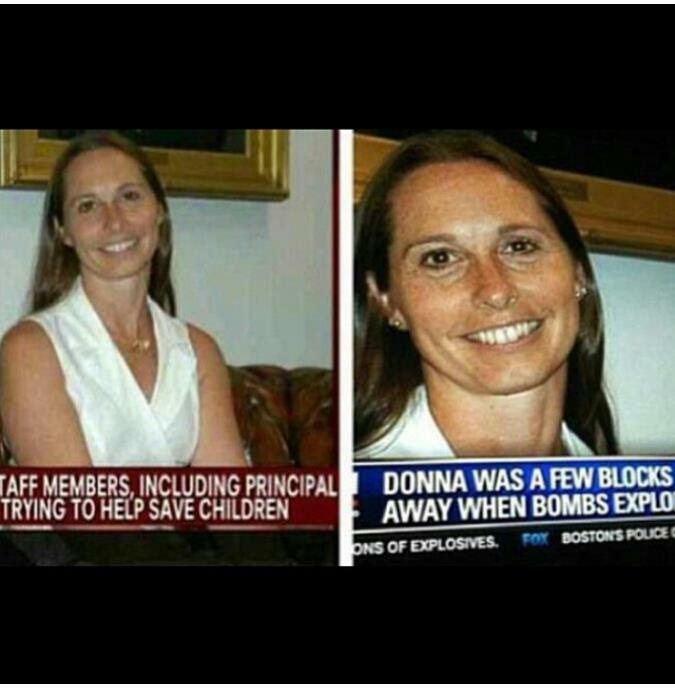 And even more perplexing is that, not only was she interviewed by CNN at the Sandy Hook incident, she was also interviewed by CNN at the Boston Marathon Race Bombing!!! Facial recognition shows that: 1) the chin is the same, 2) the nose is the same, 3) the lips are the same, 4) the hairstyle is the same and, 5) look at the unusual way the eyebrows are thin at one end and thick at the other in both pictures. They’re a perfect match! 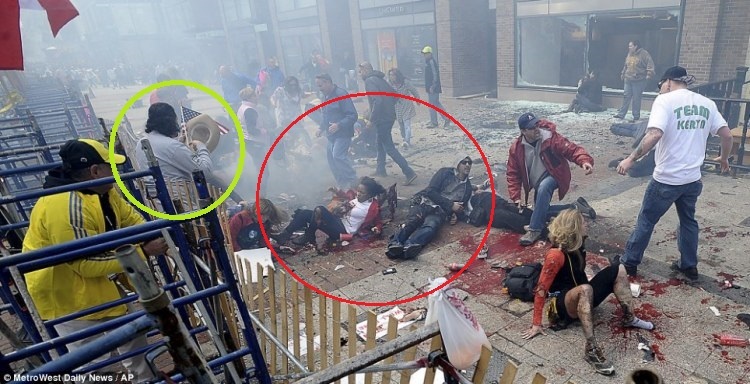 This is the same person, at both crime scenes and, interviewed both times by CNN. What, in the name of the lower planes of Gahanna, is going on here? Unless there was a zombie apocalypse that I wasn’t informed about, how are these same people who are supposed to be either dead, or living in the Sandy Hook, appearing in Boston, Massachusetts? Fortunately for everyone, America is not the only source of news, and in light of recent in events in Boston, this is a Godsend. Euronews is the international and European news from a European perspective and they have also been reporting on what happened during the Boston Marathon Race Bombing. 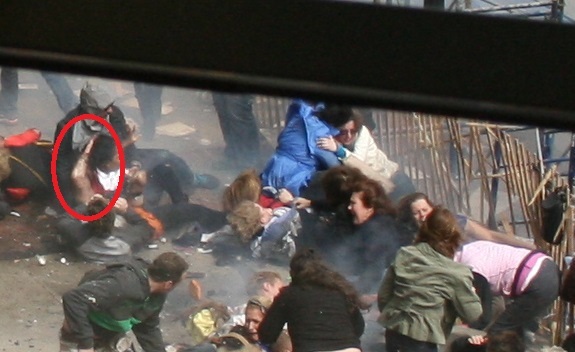 Figure 75b, once the man had screamed and gave out his warning signal, the two men that are circled in red within the green circle immediately turned their heads while the other man, towards the upper left hand corner of the photo, also circled in red, began stepping away. All three of them either turned their heads or starting moving back once the signal (the scream) had been given. It was only then that the dust cloud had appeared (within the green circle). 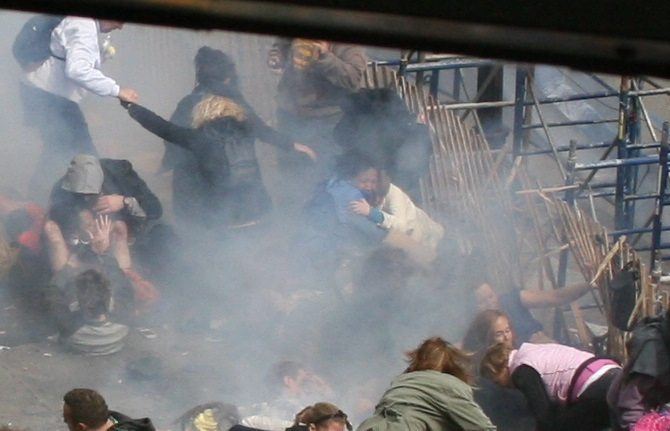 This is supposed to look like the same sort of dust one would expect to see after an explosion. So, as you can tell by the photos, it is quite obvious that this is another “staged” event at the Boston Marathon Race Bombing. 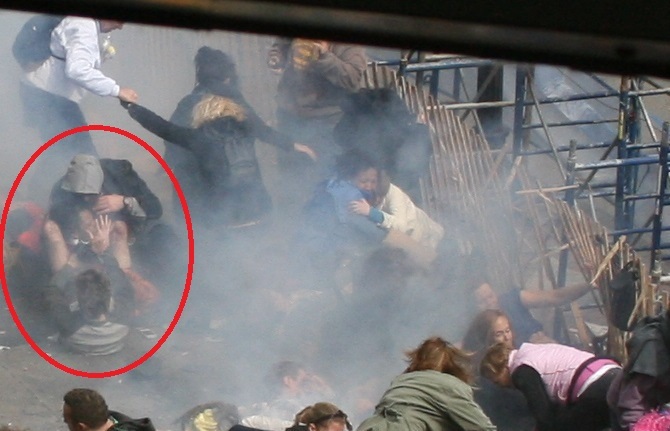 At least 3 to 4, possibly more, of those folks in those photos are nothing but actors, who are there to help create the illusion of this staged event. The Chinese proverb says: “One picture is worth a thousand words”. These photos are speaking volumes! Figure 78 . So, why this same event covered in any of the American newspapers? ***NOTE: The Okaz article can be read on my web site @: www.itsagodthingproductions777.com in the “News Article” section, under the title of: “ARE THESE PICTURES OF MICHELLE OBAMA VISITING THE SAUDI PUT ON A WATCHLIST LAST WEEK?” I believe you’ll find this article very enlightening indeed! There it is Ladies and Gentlemen! Instead of more answers being provided clear up things, we are left with more questions and convolutions. 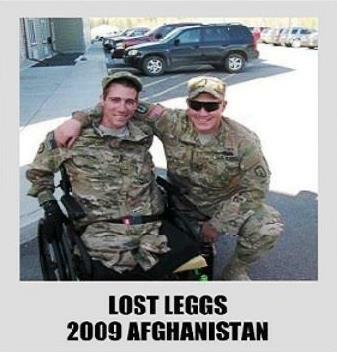 Something is terribly wrong here folks! 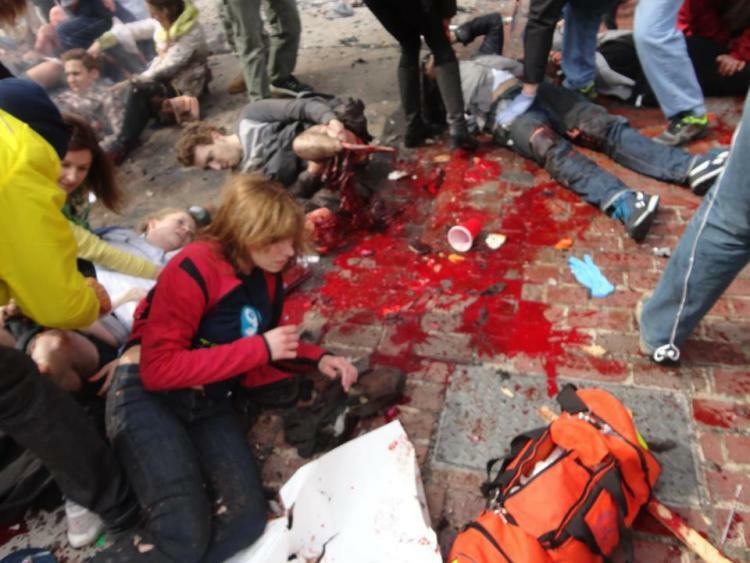 And the more information I find out, the more I am convinced that the hand of the Illuminati is behind those events of the Boston Marathon Race Bombings. The big question would be…why? Why would the Illuminati do this? There is an answer, and it is a most disturbing one. 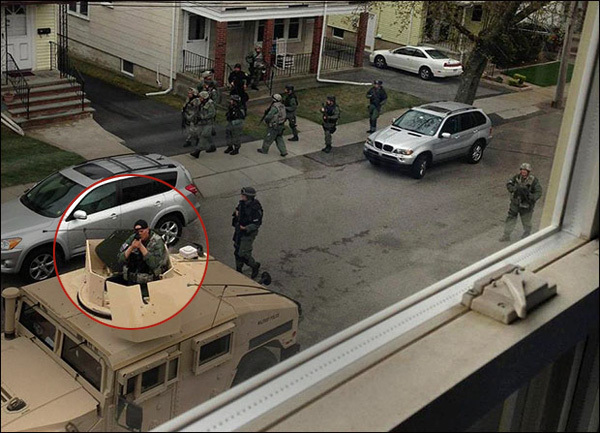 In Figures 79 – 83 we see members of the Boston SWAT team forcing people out of their homes at gun point. 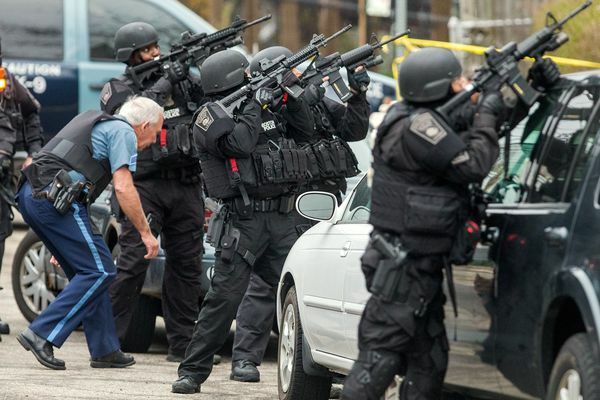 As I had watched the footage of these events, members of the Boston SWAT team were terrifying the occupants of those homes. 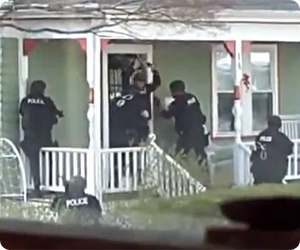 Occupants of these homes were having their front doors banged upon, they were being screamed at, guns were being pointed, and they were illegally being forced to leave their premises without a search warrant or a warrant for their arrest. Some were even forced out of their own homes without being allowed to put on any socks or shoes. 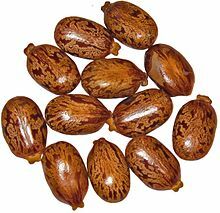 They were forced out barefooted! 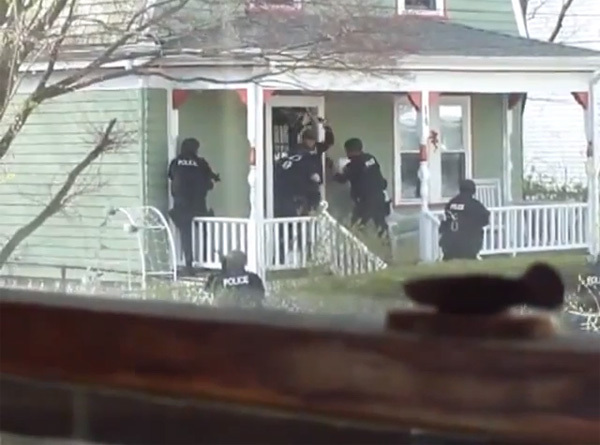 Figure 83 Police House Raid Watertown MA . 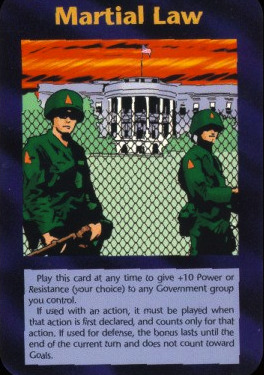 This was an exercise for “Martial Law”. 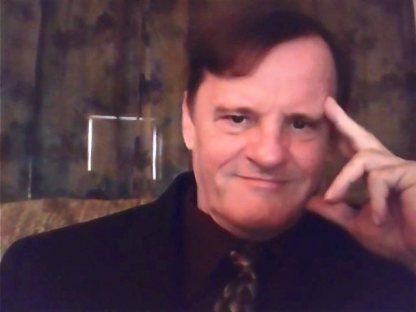 Remember, my dear and good folks, how many times over the last 34 years I’ve explained that the Illuminati will never do anything on a large scale until they’ve practiced it on a small scale first. They do these things on a small scale first to try and determine if they can predict all the moves and the eventual outcome; like a chess match. If things happen the way they’ve predicted, then they will move things up to the larger scale. Quick example would be those events that unfolded during the Nazi Regime; that was the small scale. The bigger scale is happening here in America right now. Slowly and systematically we are being turned into the New Nazi Regime, and it will continue as such unless we put an end to it. But, that’s a tale for another time. Take care everyone and God keep each and every single one of you…Doc!